This is one of C’s favorites. I don’t dread eating it either. There isn’t too much I dread eating, if I’m honest. I usually use chicken, but use pork, shrimp – whatever tickles your fancy, as Rose would say. Also, I omit the tofu because it kind of creeps me out. I make one and a half times the sauce that the recipe below calls for. I think it needs it, but do what you want. Confession: I don’t have a kitchen scale and I get hopelessly confused trying to covert grams ounces to grams or cups to millilitres. When in doubt: guess. It hasn’t steered me wrong THAT many times. In a large bowl, soak noodles in boiling water for 15 minutes. Drain and set aside. In a small bowl, whisk chicken broth, sugar, fish sauce, lime juice, ketchup and hot pepper flakes; set aside. Cut chicken into 1/4″ strips. Cut tofu into 1/2″ cubes. Set both aside. In a wok or a large frying pan, heat 1 teaspoon of oil over medium heat. Cook egg, stirring occasionally, until scrambled and set. Transfer to a large plate. Wipe wok, add 1 tablespoon oil, increase heat to medium-high and stir fry the garlic and chicken until the chicken is mostly cooked. Add the shrimp and continue cooking until they turn bright pink. Add to the egg. Heat the rest of the oil, stir in tofu and red pepper. Cook, stirring occasionally, until tofu begins to brown. Stir in the noodles for one minute or until they start to soften. Pour in the sauce; stir fry until the noodles are tender. Return egg mixture to the pan; add bean sprouts and half the green onions. Stir until heated through. Remove to warm serving dish. 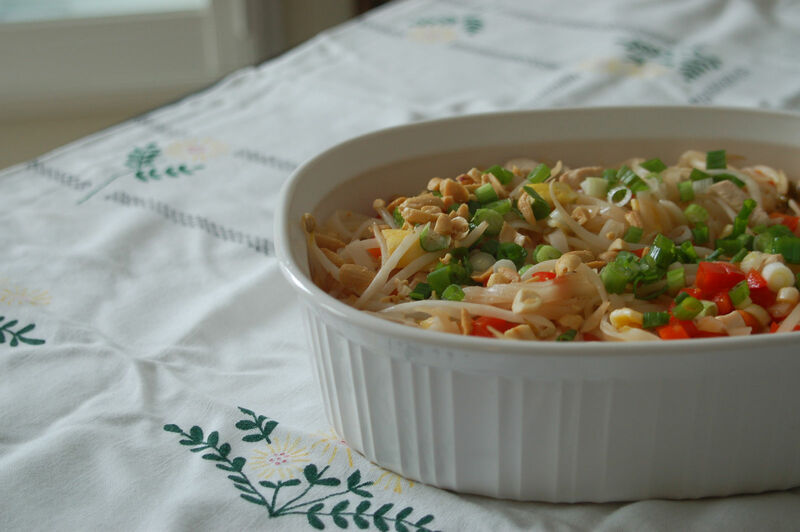 Garnish with peanuts and remaining green onions. Serves 4.